Necklace with amber bead from the Late Bronze Age. The father of the current owner (George Morrison), retained the bead after the discovery of and transfer to the museum from the RIA, of the Banagher Hoard (RIA 1918.349-53) in the early 20th century, now known to have been found at Meenwaun, Co. Offaly. 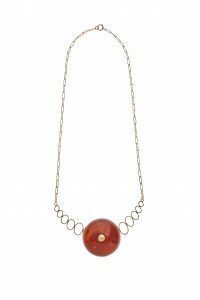 The necklace was created (using the amber bead) in 1984 by the Irish goldsmith Trevor de Paor, and as it was worn by George Morrison’s late wife, the culinary expert Theodora Fitzgibbon. Mary Cahill describes an interesting curatorial dilemma. Just before I retired from the National Museum of Ireland at the end of June this year I had the opportunity to complete a final acquisition that proved to be one of the most interesting of my entire 41-year career. It is a universal truth in museum circles that a curator’s work is never done and we know that we will never have the final word on any discovery, as new information comes to light. This is especially relevant when the following account is read along with two articles published by Niamh Whitfield in Archaeology Ireland in which Niamh described her discovery of the find-place of an important late Bronze Age hoard that had been found near Banagher, Co. Offaly, in the early twentieth century. In this particular case my final acquisition completed a transaction that started 100 years ago in 1917, when the discovery of a hoard of amber beads, gold ornaments and bronze rings in a bog near Banagher, Co. Offaly, came to the attention of the then Science and Art Museum and the Royal Irish Academy. The RIA at that time still held the royal prerogative to acquire treasure trove. The correspondence concerning the transaction was conducted partly through the RIA, not with the finder but with the jeweller, watch- and clockmaker in the town of Birr into whose possession the hoard had come, Mr George Morrison, and later with his son, Mr Edward Morrison Jr. The Morrison family had been in business in Birr since 1842 at a premises in what was then known as Cumberland Square, now Emmet Square. It was not at all unusual for jewellers to acquire such finds; they were often approached by the finders, who could realise some hard cash and avoid bringing the find to the attention of the authorities. According to the 1917 letterhead, the business comprised a Watchmaker and Jeweller, Optician and Photographer. George Morrison had been advised to write to Dr R.F. Scarff, then Acting Director of the Museum, by Sir Thomas Russell, who was, amongst other things, the proprietor of a temperance hotel in Dublin, the Russell Hotel, Dame Street, which before its closure in 1974 became distinguished as the haunt of many well-known politicians, its temperance status having long since been relinquished. In brief, the transaction between the Morrisons, the RIA and the Museum was rather fraught, with legal proceedings being both threatened and commenced before a final settlement was reached and the sum of £35 was paid for the hoard. In her articles in the Winter 1992 and Summer 1993 editions of Archaeology Ireland, Niamh Whitfield discussed the hoard (known up to then as the Banagher hoard) and later identified its find-place as the townland of Meenwaun, a few miles from the town of Banagher. No one, however, could have known until very recently that when Edward Morrison Jr handed over the hoard to the Museum he had not delivered the entire assemblage. This extraordinary fact came to light in recent months following a telephone call to the National Museum of Ireland from another George Morrison, in this case the distinguished Irish film-maker who became a Saoi of Aosdána in March 2017. Mr Morrison told how his father, Edward Morrison Jr, had retained one of the larger amber beads and given it to his girlfriend, George’s mother, Florence Downey of Tramore, Co. Waterford. Edward Morrison was then a medical student and became a well-known neurological anaesthetist. According to the account given to us by George Morrison, his mother wore the amber bead on a ribbon around her neck. The bead later came into George’s own possession, its origins never forgotten. Many years later George married Theodora Fitzgibbon, the very well-known writer of the Irish Times cookery column and author of many books on cookery, autobiography and fiction. In 1984 George decided that the amber bead was not shown to its best advantage when worn on a ribbon and designed a gold mount for it which was made by an Irish goldsmith, Trevor Power. It is stamped with his maker’s mark, TdeP, and other appropriate Irish hallmarks. The piece was worn by Theodora on many important social occasions but unfortunately there is no photograph showing it being worn. In 2017 George Morrison decided that the last known bead from the necklace should find its place in the National Museum. He had a sense that his father should not have kept the bead and wanted to complete the transaction that had started 100 years ago—a certain feeling that there was some unfinished business to be concluded. This presented us as museum curators with a small dilemma. Although George Morrison had very thoughtfully designed the mount with a view to the possible removal of the bead without damaging it at some future date, the bead in its new ornamental setting had by its association with two significant historical persons, both of whom have contributed to Irish cultural life in their own individual fields of endeavour, become something more. The removal of the bead from its mount and its reunion with the beads on exhibition in Kildare Street might seem to be an automatic decision but, having considered the unusual circumstances and the extraordinary history of the one remaining bead from the hoard, both my colleague Dr Audrey Whitty, Keeper of Art and Industry, and I came to the conclusion that it would be best to retain the bead in its new setting, as it has assumed a new cultural and historical context through its association with both George Morrison and Theodora Fitzgibbon. The true prehistoric origin of the bead will always be recorded in the archives—it is the 128th bead from one of the best-preserved amber necklaces ever found in Ireland—but the bead in its gold setting has become an amalgamation of prehistory and history, encompassing within itself the memory of its original, undoubtedly socially important late Bronze Age owner and its more recent distinguished owner and wearer. While I would not usually encourage using a bead from an amber necklace in this way, in this particular case we acknowledge the true biography of this piece and are very grateful to George Morrison for depositing it in the national collections and completing the circle bead by bead. I am also very grateful to Valerie Dowling, NMI’s Senior Photographer, for the images that illustrate this article so beautifully. A more comprehensively illustrated version of this article can be found in the Winter 2017 issue of Archaeology Ireland.